The US has belatedly permitted six film companies to fly unmanned craft while the UK has dozens. Hollywood studios and TV producers are hailing a release of US airspace to unmanned drones but the situation is quite different in the UK where aerial filming restrictions are tight but not draconian. After considerable lobbying by producers and trade bodies like the Motion Picture Association of America, the Obama administration announced a “significant milestone” towards the commercial exploitation of drones opening access to six production companies. These are: Astraeus Aerial, Aerial MOB, HeliVideo Productions, Pictorvision, RC Pro Productions, Vortex Aerial and Snaproll Media. The US Federal Aviation Administration (FAA) had held out against any commercial use of Unmanned Aerial Vehicles (UAVs) in a lock-down which US film-makers argued was forcing them to shoot abroad. FAA guidelines nonetheless include: a flight ceiling of 400 feet; restricting the flight zone to 'sterile areas' of closed studios; operation through certificated pilots; keeping drones within an operator’s line of sight and no night flying. Some of these regulations also apply to the UK aerial filming industry regulated by the Civil Aviation Authority (CAA), but around 400 companies or individuals have a licence to shoot and fly, not six. Among them is Skyvantage, based in Reigate, Surrey. 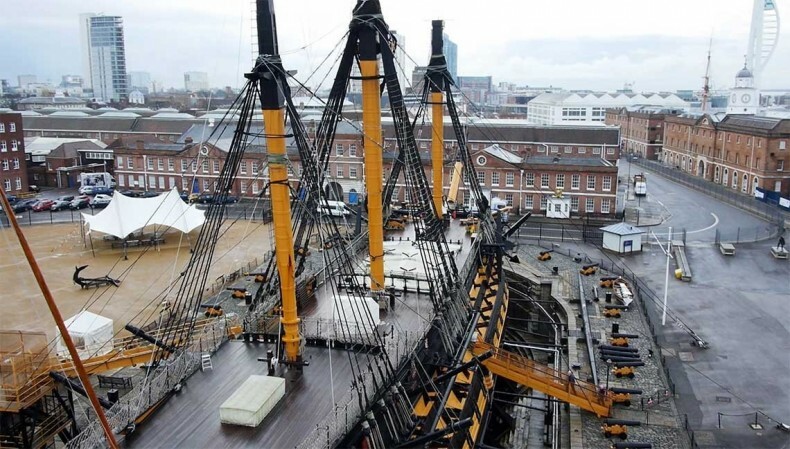 It has performed aerial shoots for BBC Sports Personality of the Year 2013 and numerous TV commercials, including one for Portsmouth Historic Dockyard. Like the FAA, the CAA permits flying only up to 400ft high (helicopters cannot fly below 500ft) however Pocock says he can apply for extended heights on a job-by-job basis. “We can also fly out to 500m giving us a 1km radius and can if required fly at up to approximately 50km/ph but need line of sight with the UAV at all times,” he says. To be strictly legal three people are required to operate a drone – a pilot, a camera-op and a 'spotter' though in practice drones tend to be a two-person operation. While flying a UAV requires a pilot's licence, a camera operator needs dexterity. Pocock, intriguingly, finds that this skill is most common in operators who have spent some time game playing with Nintendo and Playstation joysticks. He estimates that 70% of the enquiries Skyvantage fields are for work they cannot fulfil because it is not possible to gain permissions. So in theory, the use of UAV for news crews is a great idea but in reality - unless you are going to break UAV flying rules and regulations laid out by the CAA - it may not actually be possible. Skyvantage builds its own drones and uses Panasonic GH4 cameras capable of 4K work. The price per job is on an individual basis with factors including the location, risk, amount of pre-shoot work required (such as site visits or obtaining special flying permissions, if required) playing a part. Aerial photography prices start from £895, with aerial filming from £995. The company also offers full editing and film creation packages. Privacy is another area of concern, the issue highlighted in the US recently when a New Jersey man shot down a neighbour’s camera-equipped drone claiming self-defence. He was arrested for his efforts though the case is not clear cut - some people will feel he had the right to defend himself against an unlawful robot intrusion. In another invasion of privacy – or possibly canny stealth marketing – the Star Wars set at Pinewood was buzzed by an aerial drone and the video posted online (http://www.theguardian.com/film/video/2014/sep/12/star-wars-set-drone-video). The footage was apparently taken accidentally by a man taking publicity shots for a flying school.